The term "railroad" (often used as an adjective or verb) has strong connotations in RPGs. It means a linear story with little or no opportunity for departing from the linear path of the plot. It has negative connotations: GMs who punish player creativity are railroading them, GMs who reject player ideas to keep them on the path are running railroad campaigns, and GMs who kill off parties for daring to pursue some other objective than the one they laid before them are punishing them for "going off the rails." But a linear campaign can work extremely well, when run right. Linear games have all kinds of advantages. They're fast-paced, focused, have clear themes, and resemble epic fantasy stories in the vein of Lord of the Rings and other favorites. There is one main goal that the PCs are trying to achieve, though there could be occasional side quests. Though the central conflict remains the same, the campaign shifts dramatically in response to the PCs' decisions. This is because the entire campaign is based around one main conflict, so if the players force the antagonists to change, it ripples through the entire campaign, not just a part of it. The players' characters all have personal reasons to unify around the central conflict. Because there is just one central conflict, all the characters agree that it's important, and all the characters feel passionately about it for their own personal reasons. There is a consistent feeling of momentum. Sometimes the PCs are racing against the clock. Others, they're searching for leads or amassing resources while looking for the next opportunity to advance their goal. Linear campaigns focus on one central conflict, so every adventure moves toward resolving the same conflict. No quest is ever "put on hold" so another quest can advance. The story builds toward a single dramatic climax where the PCs confront the antagonists and resolve the central conflict, which is the only conflict, all at once. In a "sandbox" game, there are multiple threads that resolve over time. A railroad is weak on most of these characteristics. It has one main goal, but it fails to shift in response to the PCs' actions. It's built to tell the GM's story, not the PCs' story, so it's usually first and foremost about saving the world, rather than achieving the goals the players want for their characters. Though there might be a constant feeling of momentum, it's driven by outside threats, not the PCs' internal drives. It builds to a dramatic climax, but is it a climax the players dreamed of when they made their characters? We should continue to use "railroad" to describe bad linear stories. 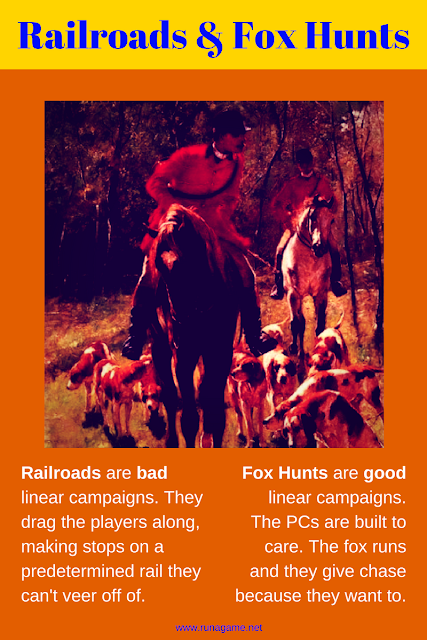 I propose we also adopt "fox hunt" to describe good linear stories. A locomotive travels forward along the tracks because it can only travel forward along the tracks. The hounds could go anywhere they like, but they won't. The hounds are chasing the fox because they want to chase the fox. That's no coincidence: The hunters trained the hounds to be fox hunters; just like the players should create characters who have personal reasons to care about the central conflict. And the hunters set their hounds to chase a fox, not a bear. The GM should make sure the campaign is about the things the players and their characters care about. It doesn't matter what train is on the track. It could be an old steam locomotive or a modern diesel - the track is the same either way. The GM should take note of how the players constructed their characters' motives around the central conflict and hook the campaign's story elements into the details of PCs' motives. That requires the GM to look at the people, places, and things involved in the characters' goals, fears, and histories. Who killed Ragnar's father? The fox killed Ragnar's father. Get that fox, Ragnar! A locomotive goes forward according to a timetable, and even though the conductor can sometimes choose between two stations at a junction, the track doesn't really adapt to the train. That's the opposite of the relationship the fox has with the hounds. The hounds chase the fox, and if they try to cut it off at the brook, it has to swim across and hide in the hills. If the hounds try to corner it in the hills, it has to make a run for the forest. The train goes where the track goes. The fox goes where the hounds aren't. Every step of the way, the hunters can tell the fox is fleeing the baying of the hounds. The GM should adapt to the players. The antagonists should be sly like a fox. Antagonists can also strike back at the PCs, like the fox can fight the hounds. The locomotive's pace is as fast as safety allows. A train only hurries to make its stops on time. When a train is delayed, it's an annoyance. When the hounds are delayed, the hunt is in peril. The crafty fox slipped the chase. The hounds find themselves at the brook, sniffing both banks while the hunters fret. Then a hound barks. She's caught the scent again, and they're off! Suddenly, they're bolting heedless through the brush, panting with exertion and exhilaration. No train has ever felt such passion. The pace varies throughout, mixing slow sweeps across the dell looking for a scent with heedless sprints through the woods. It helps that, when the pace slows, the PCs are genuinely concerned. They want to be off on the hunt, but they've lost the scene. They're desperate to get back to it because they care. A railroad's length is determined by its geography, not its value as entertainment. A train ride takes as long as it takes to get from A to B. A long trip is supposed to take a long time. But a fox hunt's duration is paced for excitement. It can't be over too soon, and it can't go on too long, either. The timing and pace are as important as claiming the trophy at the end. Though the chances that a hunter will die are very low, a fox hunt is designed to feel like a risky adventure. Fox hunts were an opportunity for aristocrats to feel a thrill, even if the real danger was fairly low. Similarly, one of the core competencies of running an RPG is to inflate the players' feeling of danger.